This introduction to Friction Forging® will cover the technical aspects and terms of what makes a good blade and how we create a “Super Blade” through Friction Forging®. We will briefly discuss some time proven and tested methods that produce blades and edges that consistently out perform others. Our research has developed techniques and made technological advances that take manufactured knife-edge performance to the next level. Friction Forging® does not involve a “mystery”, or “secret steel”. To the contrary, Friction Forging® involves metallurgical, chemical, and engineering facts gained from years of research performed at MegaDiamond, Advanced Metal Products, DiamondBlade, Knives of Alaska, universities and other companies. Performance advancements were built upon a metallurgical knowledge base from decades of research and practical knowledge in metallurgy, knife making, and general industrial uses of steel. WHAT IS A SUPER BLADE? STAYS SHARP LONGER: A blade that holds a “shaving sharp” edge significantly longer than any premium blade steels when comparing blades that have the same EXACT edge and overall profile geometry and when the other blade steels have been heat-treated, processed and sharpened to their maximum “best performance” characteristic. HAS FINEST GRAIN STRUCTURE: Measured with Transmission Electron Microscope (TEM) and Scanning Electron Microscope (SEM) micrographs, Friction Forging® has been proven to create “nanosized” superfine grain structures. Finer grain structure equates to greater edge strength, toughness, and a longer lasting edge. DIFFERTIALLY HARDENED BLADE: A knife that has a fine-grained, hard, tough edge for long-lasting sharpness yet the remainder of the blade is softer and slightly “springy” and very tough is one of the trademarks of a superior blade. CORROSION AND RUST RESISTANT EDGE: A blade edge is subject to chemical as well as abrasion deformation (dulling). A stainless edge reduces or eliminates this problem. Friction Forging® creates a super stainless edge by increasing the Chromium content in the ferrite. A “Super Blade” steel must start with “the right stuff” in it before we attempt to make it better through Friction Forging®. Blade steel is mostly iron—ferrite. When controlled amounts of other elements, especially carbon, are added iron becomes steel. These added elements increase strength and toughness, machinability, and corrosion resistance and hardness for better edge retention. Vanadium (V), Chromium (Cr), Molybdenum (Mo), Carbon(C), Manganese (Mn), and other elements combine to bring desirable blade characteristics. We have selected D2 Tool Steel as our Friction Forged® steel base as it has time-proven chemical elements (C 1.5%, Cr 12%, Mo .8%, V .9%, Mn .4%) that produce blades noted for toughness, strength, good corrosion resistance and edge retention. What is forging? “Forging” is the technique of shaping steel, through pressure and heat by hammering, pressing, or rolling. Knife blades have been forged for thousands of years, using hand-held hammers, power hammer mills, or some other pressure exerting force. Steel exhibits polymorphism characteristics, that it, it can exist in different states from a fine-grained, super hard and brittle material, to one more ductile and coarse grained. When forging is performed in conjunction with the proper heat treatments termed thermocycling, the crystalline structures of steel, (grains), can be changed. When blades are heated above the transformation temperature and held there for a period of time, the grain structures become finer, alloyed and chemically homogeneous with the desired elements. At these high temperatures, when the blade steel grain structures are transformed to a very fine state, it is referred to as austenite. The quench is a technique of cooling the blade in still air, circulated air, oil or other quenchant. When cooled slowly the grain structures will change to a softer, larger grain sized mixture termed pearlite and cementite, and the steel will be softer. If quenched from the transformation temperature quickly (less than 10 seconds), and under controlled temperature/time schedules, the pearlite transformation is “frozen” out, and the austenite becomes fine-grained, hard martensite. Friction Forging® provides rapid heating, deformation, grain refinement through dynamic crystal shearing, and rapid cooling to produce an outstanding microstructure. Gas nozzles create an argon gas “hood” over the processed zone to reduce oxidation and further assist the quenching process. Visualize a steel blade as an object made up of a multitude of crystalline, multiple faced structures with distinct boundary regions between the different grains. It is accepted common knowledge and a metallurgical fact that the finer the grain, the stronger the metal. In other words, the steel is not as prone to develop cracks and chips in a mosaic of fine-grained as opposed to coarser grained material. This is especially the case when there are no “buffers”, such as oxides between the grains that will be prone to allowing a crack to run between the grains in the oxide regions. In addition, the knife-edge is less prone to deform (dull) when that edge has a hard and fine-grain structure. Thus, the finest knives in the world will have a fine-grained and hard, but not brittle, edge and they stay sharp longer—much longer! Blades that are uniformly hard throughout are more brittle and will break rather than flex when significant transverse loads are exerted. Extreme examples are flint, ceramic and glass. If sharpened, all would have extremely sharp, hard edges but will not stand much transverse force. The same holds true for a steel blade. If it is uniformly hard, the blade is not very forgiving and will break more easily than a blade with a softer spine but hard edge. Thus another measure of a high performance blade is one that has a softer tough spine and a very hard edge that is not so brittle as to chip in normal use. Processes to obtain this characteristic are termed differential hardening. When done by a master blade smith, the edge is heated to the critical transformation temperature then quenched quickly, between 1 and 10 seconds for maximum hardness and then tempered. Tempering reduces brittleness from the pure martensite grain structures by relieving stresses developed in the rapid quench. Tempering for standard knife blades is accomplished by re-heating to a few hundred degrees for a specified time and that produces slightly softer steel to reduce brittleness but the trade off is that the edge holding ability is reduced. Historically, the very best blades have the fine-grained, hard, superior edge holding characteristic that, through tempering, has removed the “brittleness” from the edge. The remainder of a high performance blade will be tempered differentially to obtain the softer, tougher steel that is resistant to breaking and will have a certain “spring” to it. WHAT IS FRICTION FORGING® A KNIFE BLADE? “Friction” Forging® is a localized forging process achieving high, transformation temperatures and high loads against a blade and then employing specialized techniques to achieve a rapid quench. The Friction Forging® is performed on the knife blade in the area that will eventually become the edge. Friction Forging® uses a specially designed tool made from Polycrystalline Cubic Boron Nitride (PCBN), a material second only to diamond in hardness. During forging, the PCBN tool penetrates the blade while rotating, which creates frictional heating. When the tool is fully engaged, it moves along the eventual blade edge, creating dynamic microstructure shearing and the high forging pressures that produce excellent blade microstructures. The speeds, heat and down forces are monitored and controlled by the process computer to ensure the creation of a high-quality blade. The blade edge is brought up to the transformation temperature by the tool. As the tool moves, the blade material is continuously forged. The combination of thousands of pounds of forging force, tool rotation, and temperatures above the transformation temperature produces dramatic reductions in grain size. The grains are in effect torn apart and reduced in size by the combination of very high pressure and heat. Transmission Electron Micrographs indicate that the grain size is reduced due to Friction Forging from 5 microns in typical heat-treated D2 steel down to 0.5 microns, a superfine “nanograin” size. As the steel is brought up to transformation temperatures while Friction Forging®, the carbides dissolve and go into solution. Because the quench occurs so rapidly, some of the Chromium does not have enough time to reform as a Chromium carbide and is “frozen out” in the ferrite and a stainless zone is created where the Friction Forging® has occurred. This zone is so corrosion resistant that a 10% nitric acid etchant will not etch the processed zone. The primary benefit of rapid cooling (quenching) is that the higher HRc values are obtained (65 to 68); yet because the grain size is so small and thus tougher and stronger, the brittleness normally observed in steel taken to these high HRc values does not occur. The higher the HRc values, the better the cutting performance and edge longevity—as long as the brittleness issue is managed as it is with Friction Forging®. REMOVE THE HUMAN FACTOR: Be “hands off”. Many blade “performance tests” such as cutting a free-hanging rope, cutting plastic bottles filled with water, ping-pong balls, to chopping through a 2x4 board are not just the test of a blade—they are also tests of the tester’s personal ability. Human factors must be removed to enable one blade to be fairly tested against another. Our blade tests’ were done completely “hands off” to remove the human factor and insure fairness and produce measurable quantitative results. SAME GEOMETRY: When testing, test blades must be of the EXACT same edge and overall geometry. All test blades were ground on an American Siepmann VG3 grinder to a .020 edge thickness. The final edge was achieved using a mechanical fixture that operated on X & Y linear bearings and ground the .020 edges to a fine razor edge. The only time in the sharpening sequence that human hands touched the blade was the removal of the wire edge left by the final sharpening machine. Each blade had exactly the same number of passes (3 on each blade side) across a cardboard wheel to remove the burr (wire edge). TEST EDGE STRENGTH AND EDGE SHARPNESS: Three different type machines were employed to test blades. The first is a machine made by CATRA (Cutlery & Allied Trade Research Association) that is called a “Razor Edge Sharpness Tester” (REST). The machine measures how sharp the blade is by recording the maximum force required in Newtons to cut into a piece of silicone test media. Tests are conducted before, during and after abrasion testing. The second machine is an abrasion test machine referred to as an Edge Retention Tester or ERT and uses a rack and pinion reciprocating drive system that is computer monitored and programmed. A ¾ inch manila rope section is fed into the machine and the test blade cuts the rope and records the number of strokes and the thickness of rope cut with each stroke. When combined with the REST data, this can be used to determine the depth of rope cut and the number of cuts before the shaving sharp edge is lost. The third machine tests a blade’s strength by resting a blade against a fixed stainless steel rod at an 18-degree angle. Force is applied until a maximum of 65 lbs is realized. The degree of flexing, bending or chipping is noted and recorded for each blade tested. Over 600 individual tests were conducted comparing Friction Forged® blades against the exact same blade style but made up of 12 different steels. These other tests steels were 1095, BG42, AISI 01, AISI A2, 5160, 52100, 154CM, 440C, D2, CPMS90V, CPMS30, and Talonite. It is far beyond the scope of this introduction to Friction Forging® to report all these results. 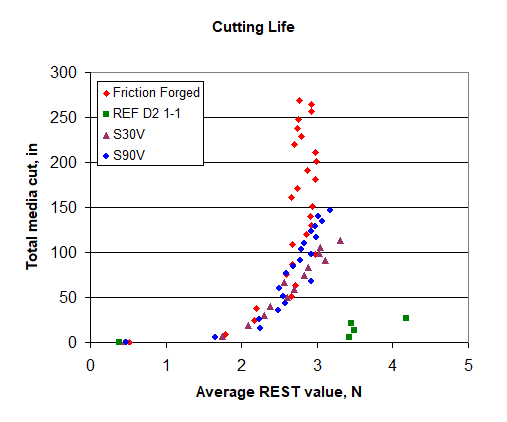 We will however, show results comparing Friction Forged® blades to “best processed” D2, CPM90V and CPMS30 as the S90 and S30 were the steels that came the closest to Friction Forged blade performance. The D2 steel was selected to show the dramatic performance increase in that steel due to Friction Forging®. The D2, S90 and S30 all had HRc values between 59-61 and all had cryogenic “deep freeze” treatments. The following graphs demonstrate the superiority of the Friction Forged® blades compared to other traditionally processed steels. 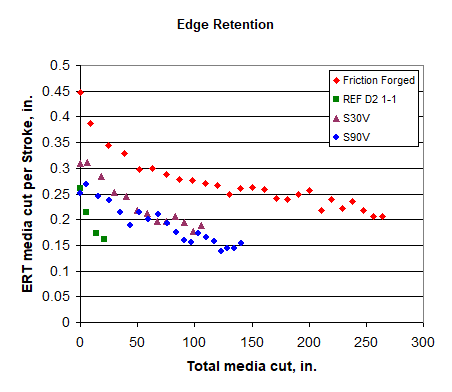 Figure 1 shows that the Friction Forged® blade starts out sharper, cutting 50% more material per stroke at the outset. But not only does it starts out sharper, it stays sharp longer. After cutting through 250 inches of rope, the blade is still cutting more than 0.2 inches per stroke. The next best material, S90V, was reduced to cutting only 0.2 inches per stroke at about 75 inches of total media cut. By 125 inches total media cut, the S90V was cutting only about 0.15 inches per stroke. Clearly the Friction Forged blade keeps its sharp edge longer. Figure 1: ERT Sharpness (inches of rope cut per stroke) as a function of the total media cut. In Figure 2, we see how much rope can be cut without losing shaving sharpness. A series of tests were performed that showed knives with an ERT value of 3 would no longer shave, while knives with a lower value would. Accordingly, the ERT test was run until the REST value was greater than 3. Ordinary D2 loses its shaving ability at about 10 inches of rope cut. S30V makes it to 100. S90V lasts until about 140. But the Friction Forged D2 still had a REST value less than 3.0 with more than 250 inches of rope cut. Figure 3 illustrates the number of strokes it takes to dull the blade. As discussed previously, the objective is to keep the REST value under 3.0. Ordinary D2 lasts for about 15 strokes. S30V makes it to about 360. S90V goes to about 799 strokes. But even after 1000 strokes, the Friction Forged D2 blade is still well under 3.0. 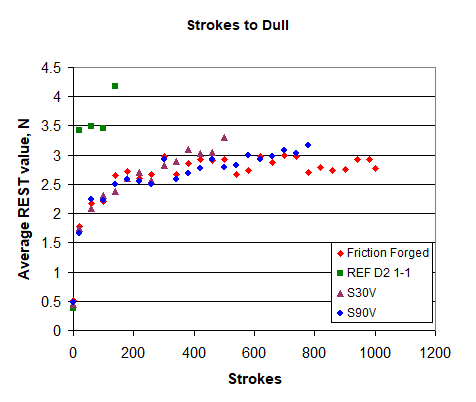 The performance in the tests as shown above clearly shows that the Friction Forged® D2 blade cuts more material at lower forces for more strokes than any of the competitors. Friction Forging® is a proven technological leap ahead of any other manufactured knife blade. The grain structures are extremely fine “nanosized” at less than 0.5 microns and thus allow a super hard, tough edge that will hold a “shaving sharp edge” longer than any other knife blade material tested under strict laboratory conditions. Friction Forging® plasticizes the forged area and Chromium carbides return to solution. The rapid edge quench freezes some of the Chromium into the ferrite before it can be combined again with carbides and actually creates a true stainless steel processed edge zone in D2. This prevents edge degradation due to corrosion. Friction Forging® allows the manufacture of a differentially hardened blade as the Friction Forged® zone is a narrow ½ inch wide zone along the knife-edge with HRc values between 65 and 68. The area immediately above the Friction Forged® zone is in the mid 50’s HRc and the remainder of the blade is engineered to have a lower HRc value of 45 thus providing a tough, slightly “springy” blade that resists breakage under extreme conditions.